Some of my friends just got back from Ireland. 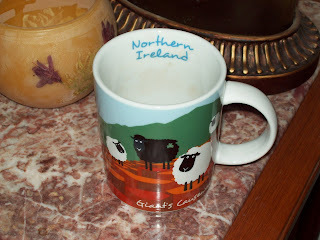 Knowing me oh-so-well, they brought me back a mug with cute little Irish sheep on it -- and a box of authentic Irish Breakfast tea bags! The tea is rich and full-bodied and the mug -- while it won't replace Tweety -- has made it onto the display shelf where I am forced to put all the mugs and teacups that won't fit into any of my kitchen cabinets. (I do not have an addiction. When we have friends over in the winter, we regularly offer tea, so all my teacups are well-used). Regular visitors to your home will soon tell you thier favorites -- and may even bring them along for you to have on hand!